Student Debt Crisis! Make College Free? Are we making our kids our number one priority today or merely setting them up for failure? The value of a college degree has long been acknowledged as the stepping stone to a stable future. There is a consensus that having a college degree is an asset, and, in today's economy, probably a necessity. While Senator Marco Rubio may muse on the need for more welders at the expense of philosophers, the need for broad-minded citizens is crucial to the continuing robustness of American social capital. And yet, he may have a point, for there is a pernicious side of the Ivory Tower as well. It plagues millions of people whose only sin is attempting to broaden their horizons and improve their lives: its name is student loan debt. While a university education affords the opportunity to develop critical thinking skills and acquaint oneself with knowledge, both practical and esoteric, there are also inherent, concomitant economic advantages. Federal government data shows that a rising level of education produces lower unemployment rates and corresponds to higher rates of personal income. Analyzing data from 2012, for example, we learn that college graduates earned 60 percent more than those with high school diplomas. The ever-rising cost of higher education, however, has put this option in jeopardy for many middle-class and lower income Americans. Current college costs now include high fees as well as tuition hikes every year. According to the College Board, the average tuition and fees for the 2015-16 academic year at public colleges varied from $9,410 (for in-state students) to $23,893 (for other students); private colleges average about $32,405. Compounding this, only a fraction of students earn a degree in the traditional four-year period. According to a study by Complete College America, fewer than 1 in 5 full-time students earn a Bachelor's degree in four years, and colleges now routinely expect students to take six years to earn their degree. 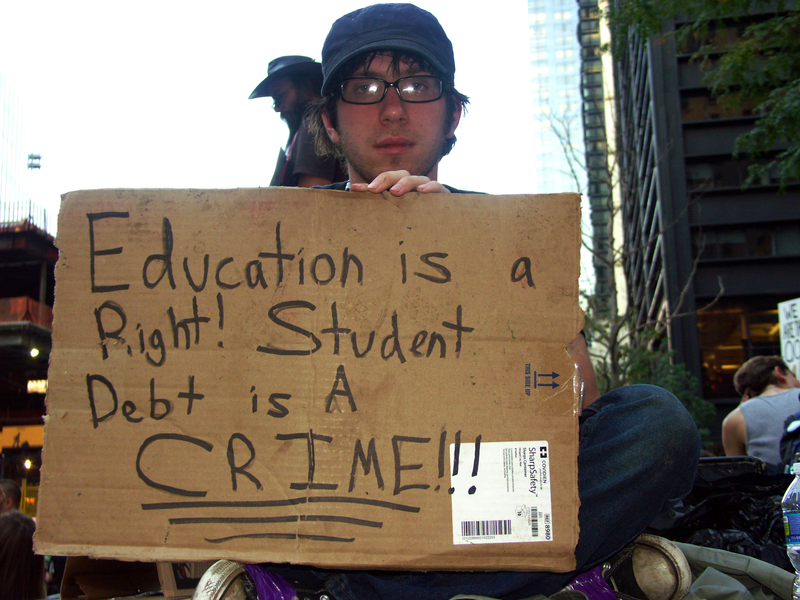 •	Today, 40 million Americans owe student loan debt, up from 29 million in 2008. •	The current amount of debt owed is now more than $1.2 trillion, quadruple the amount in 2004. •	The average current balance of debt is $29,000, but those graduating in 2014 had an average debt of more than $33,000. •	At the start of 2015, more than 60 percent of Americans with student debt were not making payments on time in a manner to reduce their debt. The majority are using strategies such as taking out further loans to pay off their current debt or deferring payment, and a further 17 percent have not kept up with loan payments. •	The three-year default rate in 2014 was 13.7 percent, with the average default around $14,000. •	Debt loads appear to increase with age. Those age 30-49 have an average debt of $31,000, and studies consistently show that the highest rates of nonpayment and default occur among those in their 30s. •	Currently, 2.1 million people age 60 owe student loans, which has tripled since 2004 and is 850 percent higher over the past decade. Their debt has more than quintupled and now totals $43 billion. Many are literally having loan payments deducted from their Social Security checks. The after effects of the Great Recession continue to exacerbate the situation as well. In a federal government study, those making up to $40,000 annually who began paying back student debt in 2009 have only paid off a measly 3 percent of their debt. In addition, 60 percent either fell behind or defaulted on their debt, with the highest rate of default among those whose debt was $1,000-$5,000. One reason is that while the job market has recovered (mostly), the level of wages remains stagnant. Those who graduated college in 2014 and landed a job had widely divergent median incomes. Those majoring in the liberal arts earned slightly more than $36,000, while the overall average was nearly $45,500. Paying back a huge amount of debt is difficult, even this level; many are not this lucky. According to a report by the Economic Policy Institute, the unemployment rate among recent college graduates is 7.2 percent, but the rate of those who are employed but making low wages ("underemployment rate") is 14.9 percent. In addition, those "idled" (neither employed nor enrolled in education) among young college graduates is 10.5 percent. The report noted that college graduates have faced jobs with stagnant wages for years: "Due to young college graduates' limited job opportunities, stagnating wages, and the rising cost of higher education, college is becoming an increasingly difficult investment." This is undoubtedly a sad state of affairs, especially for a nation as prosperous and open to opportunity-making as ours. Indeed, the resultant accumulation of debt has had a deleterious effect on the economy. A recent business survey of those age 18-35 found that 56 percent were putting off major purchases -- a house, a car, even marriage--so that they could store long-term savings because of the need to pay off student loans. A further problem is that many are choosing careers solely due to monetary considerations, to the detriment of teaching, social work, and other beneficial careers. A National Bureau of Economic Research working paper noted: "We find that debt causes graduates to choose substantially higher-salary jobs and reduces the probability that students choose relatively low-paying 'public interest' jobs." This is why I'm so intrigued by presidential candidate Senator Bernie Sander's call for free tuition to all public institutions of higher education. The notion certainly seemed far-fetched at first, but upon reflection it's a positive step in the right direction. Leaving people nearly penniless to pay of a college degree is nonsensical. 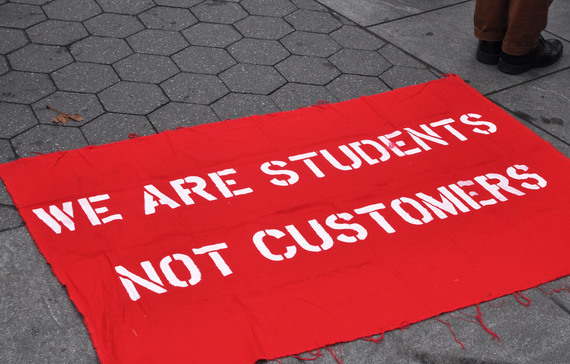 To leave the rampant proliferation of debt to the next generation of college students is unconscionable and a real abdication of our moral obligations. And to his credit, Senator Sanders' hasn't left this plank as some campaign platitude, but has laid out an explanation on how to pay for his proposal: "The cost of this plan is fully paid for by imposing a tax of a fraction of a percent on Wall Street speculators who nearly destroyed the economy seven years ago." 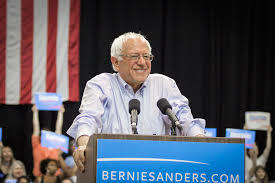 The decision to impose a tax on the same industry that spurred the recent economic downturn is sound and one that, even if Senator Sanders is not elected as President, would be one that future leaders should seek to emulate. The education of future generations is an imperative of society, part of the social contract that is the foundation of country. It is a right, not an entitlement, but we have strayed from our ideals. We've been too easily swayed by loose money, high expectations and harsh realities. To right the path, we have to consider all options to bring down the cost of the university education. Opening up public colleges to more people by making tuition gratis (or close it) can be the spark need to bring a new energy into the engine of American greatness. On both moral and strategic levels, our kids must be our number one priority. Rabbi Dr. Shmuly Yanklowitz is the President & Dean of the Valley Beit Midrash, the Founder & President of Uri L'Tzedek, the Founder and CEO of The Shamayim V'Aretz Institute and the author of nine books on Jewish ethics. Newsweek named Rav Shmuly one of the top 50 rabbis in America.